My roommate was on FaceTime with her family last night, which would include her four shiatzus. It was obvious how much she missed her pets; and after the phone call, she looked at me and expressed how much better she felt after seeing her dogs. It got me realizing how often I hear someone say how good it feels when they get to see their pets, and how happy they get when they are around their pets. I then recall times when I’ll be holding my cousin’s kittens or my friends’ dogs, and how much better I felt during that. So I decided to do some research and see if it was actually proven and known that pets are therapeutic for anyone. Here’s the insight I found:According to an article from American Journal of Critical Care, a randomized control trial was done to determine the effectiveness of lowering anxiety and additional factors with patients of advanced heart failure with a dog visit. This article was written by a combination of professors and statisticians of the School of Nursing and David Geffen School of Medicine at UCLA, as well as the Director of evidence-based practice and a cardiac nurse. The study consisted of 76 patients randomly assigned to 3 groups, with each group being watched over a period of time (longitudinal study). The first group received a 12-minute visit with a volunteer and the therapy dog, the second group was given just the volunteer, and the third and final group(control) had the standard treatment. The experiment was repeated several times, as this longitudinal study followed these patients to get effective results. The results show that the volunteer and dog group had lowered artery pressure, with the P-value decreasing from .03 to .001. Comparing from the baseline risk, the results tell us that the group with the volunteer and the dog decreased anxiety and improved the health of the patients. We can agree that statistical significance has been found, and the rejection of the null hypothesis as well. From this study, the authors of the article concluded that animal assisted therapy helps patients facing heart failure. Naturally, another source gives us more evidence that pets are therapeutic. 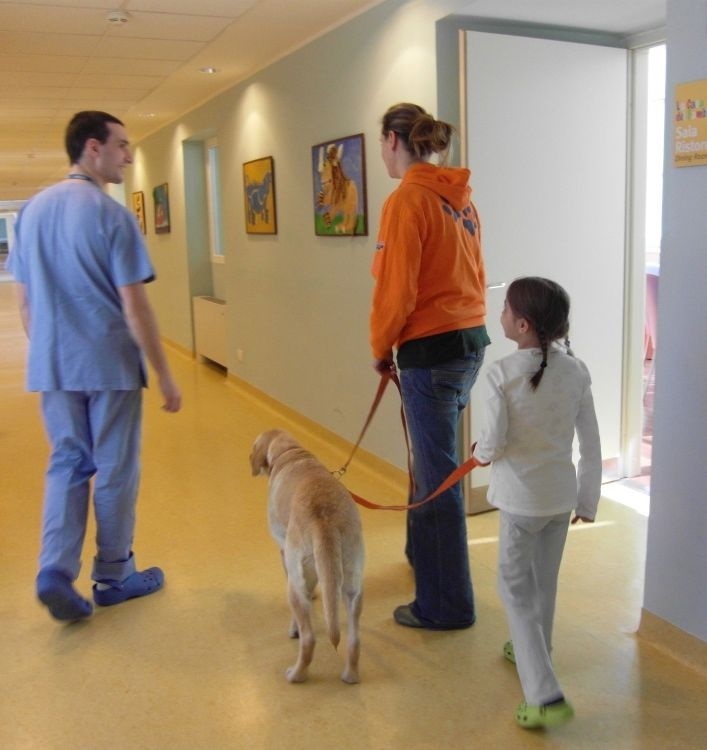 Therapy Dog International (TDI) Inc. gives an interesting take on the subject, as the results from one of their numerous surveys conducted on their patients report back immense data that patients positively changed. The patients were observed as in a better mood, more social, and more alert than they had been prior to the study. The TDI report also provides more examples of experimental and observational studies done to get the same results. An observational study involving a participant, and noticing his social interaction level was higher when the researcher had a dog, compared to the researcher without the dog. A telephone survey conducted a random sample of 399 people (200 as pet-owners) that showed results saying that the pet-owners were not lonely and felt more social compared to non-pet owners. A cross-sectional survey of 127 senior citizens indicating pet owners walked more and were more engaged in physical activity than the senior citizens who did not have pets. 44 of the 127 were pet owners. It appears that the presence of pets have seemed to help with people and have made a positive impact, based on the study results. Another study supports this, as well as supporting how pet therapy, in particular dogs are the pet of therapeutic source. Every study mentioned above included dogs in the experiments, which got me to dig a little more and see how beneficial dogs are. A case report on a ten year old girl with an unfortunate history gives interesting insight on this. Annie, a young girl who had an abusive father, was chosen to see if a dog would help her cope with her acting out, lying, aggressive behavior, and other side effects her abusive father placed upon her. She was observed before and after a session with Kotter, the dog. After her first session with the dog, there were signs of improvement, as her bad behavior declined, relaxation appeared present, and she was able to share her feelings. This study concludes the idea that pets and dogs are a reliably therapeutic source for any kind of person. The list goes on and on. I’m not at all surprised by these results, as I have personally have genuinely felt happier when in the presence of pets. I myself do not have any pets, but whenever I get to see pets of people I know, I instantly feel better and am put in a happier mindset. So next time you’re feeling down and need a pick-me-up, go see your friend’s pet, or maybe invest in owning a pet someday. They aren’t lying when they said a dog is a man’s best friend! I’m already thinking of getting a Cavapoo puppy one day(puppy photo below), because who wouldn’t want to see this when they come home and is in need of peace, happiness, and relaxation? This entry was posted in Uncategorized on October 11, 2016 by Naseem Memari. This is an excellent post. Although I have never looked into the scientific aspect of your claim, I have always felt that pets can reduce stress and anxiety. Now thanks to your post, I am able to understand the statistical aspect of this. However, I have a problem with the size of the experiment. This experiment only tested a group of 75 people which is an extremely small number. If I were conducting the study, I would make sure to recruit a significant number of people to help ensure that the results are not due to chance at all. Last blog period, I wrote a post about whether or not your dog can understand you. This topic is similar to my previous post and also helps to reassure that your pets know what you are telling them when you express your feeling towards them. I know from personal experience that my dog can cheer people up because I have witnessed it first-hand. When I left for college in August, my mom was distraught. She was crying constantly and while we were trying to calm her down, my dog came over and laid on her feet. The sense of security that dogs can provide as well as their ability to brighten your mood can have a significant impact on your wellbeing. Thank you for researching this topic to find the data to support my thoughts all along. I am taking CAS100 right now, and last week somebody performed their speech and talked about how their neighbor with autism was able to benefit from animal therapy. He would have sessions were he worked with donkeys, not the first animal that you would think of for animal therapy, and overtime he was able to open up to people more. An article from Autism Speaks explains that one of the reasons that children with autism receive so much help from animals is because they feel no sense of judgement when playing with them. I love the topic of your blog! The studies you found that were randomized control trials provide great evidence to support your ideas. However, the three examples that you mentioned towards the end seem anecdotal, so if you found more sources to back those up, they would be more convincing. You did a good job at incorporating terminology used in class! I definitely agree with you that pets make people happier, seeing as a have three cats and when I’ve gone home to visit them, I’ve felt much better! Your blog made me curious about whether or not the amount of pets one has is correlated to happiness, and here https://www.petfinder.com/pet-adoption/dog-adoption/banfield-benefits-of-multiple-pets/ is an article about how having multiple pets is better for the owner and the pets! There are some issues with the results from the study. First off, some of it seems anecdotal compared to data based. And the data that is being collected is based on the owner/non-owners self perception of their own social skills. This makes it difficult to say that pets improve social skills. This post made me miss my dog! I agree with your findings because just by reading this made me smile. I also have another theory about pets though. I think to find relaxation and happiness an individual must be comfortable. When seeing your dog or even someone else’s dog, it creates a connect to a different thing in life that makes that particular person happy, creating a direct correlation between dogs and happiness. https://www.psychologytoday.com/blog/the-social-self/201107/friends-benefits-pets-make-us-happier-healthier Here’s a little more explanation of why pets make people feel so much happier. This article goes into detail about how a pet can fulfill social needs and loneliness. It also gives examples of a few studies they have done to support this thesis!